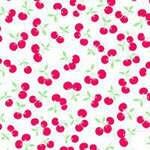 Pam Kitty Picnic Children's Fabric White and Red Cherries Holly Holderman for Lakehouse Dry Goods. Pam Kitty Picnic Children's Fabric White and Red Cherries Cotton Fabric by Holly Holderman for Lake House Dry Goods. A beautiful coordinating piece to the Pam Kitty Picnic line reminiscent of days gone by. Vintage kittens, flowers and plaids. 100% cotton fabric perfect for quilting, general sewing and crafting projects. Fabrics from The Quilted Nursery Children's Fabric Store is cut directly from the bolt with generous cuts. All orders are shipped same day!